Well, it happened. My little boy turned two this last month. I love getting to watch him grow and learn new things every day. However, there is a flip side to the cuddles and love that come with a two-year-old. 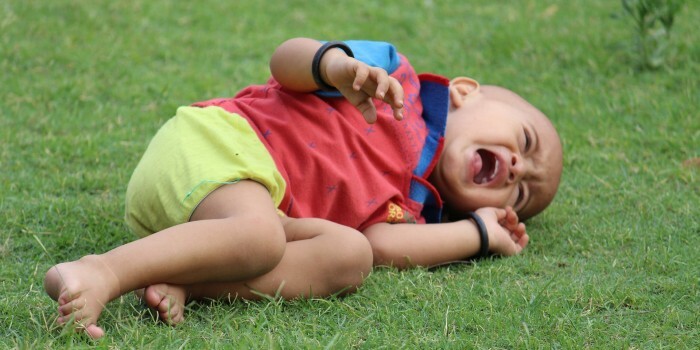 It’s known as the “terrible twos.” If you’re in this stage, I understand the pain you may be feeling as your two-year-old throws a temper tantrum over throwing away the banana peel because “we don’t eat the peel, sweetheart.” I’m going to share some ways that you can survive this stage of life. These are all small things I have done and hopefully they can bring you some relief during this trying time. Take a deep breath. It’s something so simple, but it makes all the difference. Take a more than one deep breath. Your child may be throwing a fit, but it doesn’t help if mom or dad is becoming more agitated as well. Separating yourself and getting more oxygen will help you think a bit more clearly. Even just this effortless act can help you get a different perspective on the situation and maybe you will be able to see why your young one is having a meltdown. Have lots of snacks on hand. Sometimes a cranky mood can be tied to our stomach. Even as adults we get cranky when we get hungry. I have heard it referred to as “hangry.” I have found that my little likes to eat small snacks throughout the day. Apple sauce pouches, cheerios, animal crackers, apple slices, carrots, and goldfish crackers are some of the things we keep on hand to feed the toddler if he starts to get fussy. Toddlers have a harder time communicating. After about age one they want to be more independent, but they aren’t quite speaking yet. As parents, it’s our job to sort through the irritable behavior our child might be having and determine what it is that is making them upset. Snacks are a simple thing, but a lot of times when our littles are grouchy, it’s tied to their tummy. Read a book. The close contact with mom or dad and changes of activity can help immensely. I know for me it’s always nice to have my snuggle bug in my lap and it also helps me calm down from what may have been afflicting us just 10 minutes prior. Get out of the house. Along with reading a book, get out of the house, or just change the scenery. Sometimes we have to go outside and play with our sand box or go to the park. This way he can play with different toys and be in a different place. Just being in a different place helps greatly. He has something different to do and his focus will be off what may have been plaguing him earlier. Changing it up on a regular basis helps a lot. This also goes for mom and dad. Have grandma and grandpa take the littles for a couple hours, take the time to go out to eat or even just go grocery shopping. Something to be able to spend some time with each other. Parents you need that time together just as much as your young one needs your time. Be flexible. Things can change in an instant. If your toddler doesn’t want to read a book, maybe he or she needs to be playing with a different toy. And maybe a snack is out of the question. Just be open to figuring out different things at a moments notice. Be ready for your toddler to be happy one minute and angry the next. Pray daily for your baby. Pray for yourself. It can be a small prayer. It can be a big prayer. “Lord, give me the patience to get through this.” There are days where it will be hard. “Lord, thank you for this wonderful day.” And there are days where it will be a breeze. Pray out loud. It can help for your young one to hear as you pray. Start the day with prayer and be in the Word. We read a Bible story every morning to put our hearts in the right place. Soak it all in. They are only little for so long. As you know by now, those first two years flew by. Enjoy the snuggles because after all, the “terrible twos” really aren’t so terrible. It’s just a matter of establishing that communication with your little one, figuring out their need in that moment, and enjoying it all. The list above is all based on my experience and opinion. I hope some of it can be helpful as you approach the stage ahead or even help you out when you are in the thick of it all. As I read through it all, I know I need to take my own advice. My husband would be scolding me for not following the above advice when I’m having a hard day with our two-year-old.